Happy Weekend to you all! We are in the process of cleaning out our beauty bags and making room for all of those gorgeous fall hues to come- can not wait EEEEK! With that being said, we are also cleaning our beauty tools that work to make our makeup application smooth and flawless. 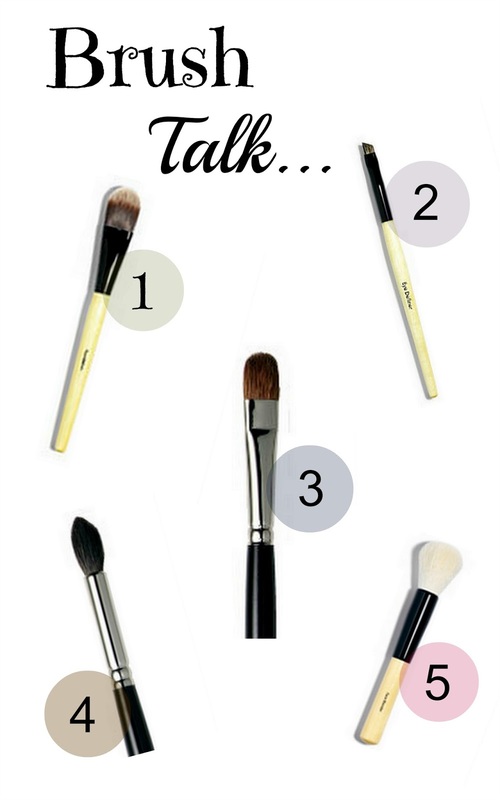 Tonight, we are going to share with you our top five “it” brushes that are a must have for all makeup lovers and beginners! Learn why they must be in your beauty bag if you are not a loyal owner yet. 1. This foundation brush will apply your foundation or BB cream like a dream. With baby soft bristles, it will give you full coverage, blending those hard to reach areas around your nose and eye area. Not only will it give you a polished radiant look, it’s cost effective, using less product to achieve a well blended application and flawless look. 2. We are in love with The Eye Definer brush from Bobbi Brown for so many reasons! It plays two significant roles in making your makeup look polished. This brush can be used to line your peepers wet or dry using a cream product or shadow. Most importantly, the eye definer brush will work to fill in your brows helping to frame your face, giving you a balanced and healthy look. Use this brush dry with shadow for filling in those brows for a natural look! 3. Oh Laura Mercier–how we love your Eye Colour brush! Perfect for sweeping your favorite shadow all over your lid and blending shadow along your lower lid. It’s super soft and tapered, making blending effortless. The oval shape helps to distribute shadow evenly. 4. The Pony Tail brush from Laura Mercier is essential for making your peepers pop! Used for layering color in your eye crease and along your lash line, its soft bristles come to a point enabling you to place color perfecting. Say hello to your beautifully blended smokey eye! 5. Looking for a multi- purpose brush that will apply your bronzer, blush and powder evenly?– You need to add the Face Blender brush from Bobbi Brown to your beauty bag, like now! With its white soft bristles it can be used to place shimmer powder and blend loose powder to set your foundation and concealer.